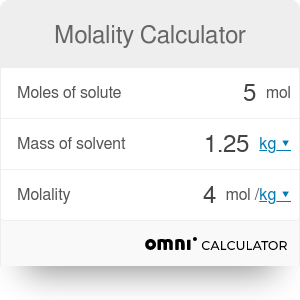 With this molality calculator you can quickly calculate the molality - one way of measuring the concentration of a solute in a solution (not to be confused with molarity). Simply type the number of moles of your solute substance and mass of the solvent and the tool will calculate the molality. If you don't know how many moles of a substrate you have, use the advanced mode to calculate it with the use of mass and molar mass of the compound. Are you still unsure what's the molality definition, its units and formula - or simply how to calculate molality step by step? Keep reading and you'll find the answer! W solute is a molar mass of the solute (in g/mol). The molality unit from SI system is mol/kg, sometimes the name molal is used (though it's considered obsolete). Molarity and molality are similar concepts - both are measures of concentration of a solution. However, there is one main difference between those terms: molarity is expressed as the amount of substance per unit volume of solution, whereas molality defines the concentration as the amount of substance per unit mass of the solvent. Choose your substance. Let's assume it's table salt - sodium chloride (NaCl). Calculate its molar mass. For sodium chloride it's equal to 58.44 g/mol (as Na = 22.99 g/mol and Cl = 35.45 g/mol). Convert grams to moles. Use the formula moles = mass of solute / molar mass. Assume we want to dissolve 70.128 grams of salt in 1.5 kg of water. so moles NaCl = 70.128 g / (58.44 g/mol) = 1.2 mol. Plug moles value and the mass of the solvent into the molality formula. Divide 1.2 mol by 1.5 kg, and you'll find out that the molality of the NaCl solution is 0.8 molal (in standard molality units: 0.8 mol/kg). Or save yourself some time and use our molality calculator (choose an advance mode to enter also the molar mass and solute mass). Molality calculator can be embedded on your website to enrich the content you wrote and make it easier for your visitors to understand your message.